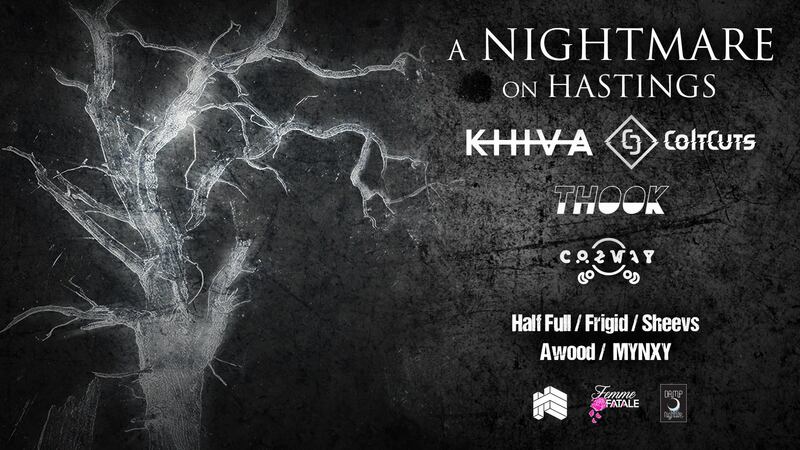 Damp Nightlife, Femme Fatale & High Etiquette invite you to the darkest corners of East Van, for a dance that may be your last..
Honouring a deep longing to convey a passion that arises from somewhere far beneath a visible reality, Khiva attempts to bring the deep rooted to the surface. Finding her true love within sonic sculpture, and nurturing a propensity toward the emotionally fuelled and often dramatic, dubstep and bass driven 140-centric styles offer a natural focal point, but in no way a limit, for her musical exports. Damp Nightlife is a trio dedicated to maintaining Vancouver’s underground. Keep it locked. Keep it Damp. Femme Fatale is a Collective of female creatives that emerged two years ago to provide an outlet for female producers and DJ’s in the city to share their sound. Femme Fatale is about creating a vibe that is inclusive, creative and fun. We are a west coast art collective representing elevated life.